It is the dynamism of the economy, the entrepreneurial ability of the people, not land area and width of the Exclusive Economic Zone (EEZ), that matters most. 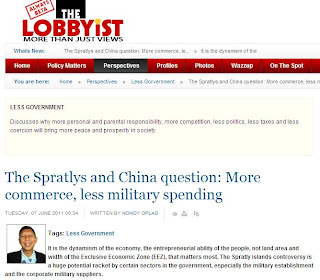 The Spratly islands controversy is a huge potential racket by certain sectors in the government, especially the military establishment and the corporate military suppliers. 1. Singapore, 710.2 sq. kms, 1.44% water; 5 million people (36 percent foreigners), per capita nominal GDP $40,336. 2. Hong Kong, 1,104 sq. kms, 4.58% water, 7 million people, per capita nominal GDP $31,590. 3. Basilan, 1,358.9 sq. kms., 8.8 percent water, 0.5 million people. Philippines per capital nominal GDP $2,007, Basilan’s would be at most one-half of that. 5. 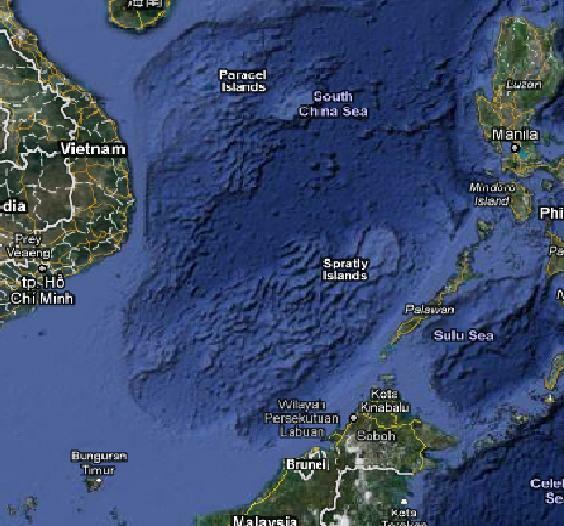 Spratly islands, less than 5 sq. kms. over 425,000 sq.kms. of sea. 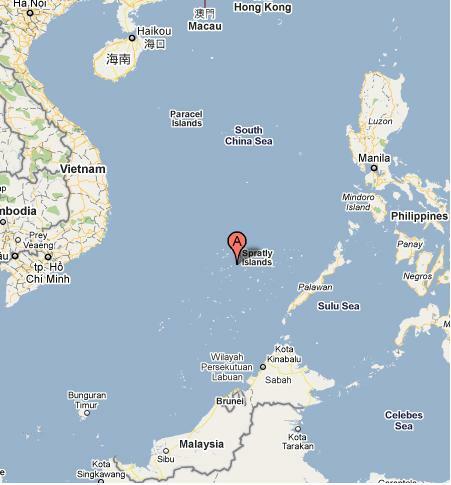 Sulu archipelago alone has almost 6x the land area of Singapore, and almost 4x that of Hong Kong. Basilan island alone has almost 2x land area of Singapore and larger than that of Hong Kong. And yet observe the big discrepancy in per capita income between the Philippines and that of Singapore and Hong Kong. Now there are lots of political and media noise for the Philippines to add more military spending, to tax more, to borrow more, for what -- to help “check” China in the Spratlys? We cannot even develop economically existing islands like Basilan, Sulu archipelago, Tawi-tawi archipelago, and now the vested interests in the military establishment want more money from us taxpayers, to “defend and protect” those far away islands, islets and atolls? It’s as if we have lots of resources to develop those areas even assuming that China and other Asian countries would stop their claim over those far away areas. I think that the existing military establishment is already bloated. The Armed Forces of the Philippines (AFP) has an engineering brigade, because the DPWH and local government engineering divisions are either underfunded or corrupted. The AFP has social work projects, even medical missions, because the social work and health departments are either underfunded or corrupted. If the military and the police are efficient, all they can do is provide security protection to the DSWD, DPWH, DOH, DepEd, etc. personnel to do their real work even in far flung areas. So, how to “check” China in Spratlys and other islands given China’s repeated “intrusion” in territories claimed by the Philippines? The first option is diplomacy. The Department of Foreign Affairs (DFA) has the mandate and expertise for this job. There are plenty of existing avenues and forum where such issues can be taken up with the governments of China, Vietnam, Malaysia, etc. Like APEC, ASEAN + 6, the UN, other bilateral and regional meetings. The second option is more trade, commerce, investments, tourism. If China is richer now, that is partly because Filipinos have been patronizing thousands of ships and containers of cheap toys, shoes, clothes, appliances, electronic products, etc. from China. That country is now the 3rd biggest export market of the Philippines., soon to displace or overtake the US as the country’s 2nd biggest export market. And China did not send a single tank, a single battle ship, a single fighter jet, a single soldier, for this to happen. China will not antagonize an economy that has tens of billions of dollars per year of already existing trade and business deals, to the point of sending many tanks, battleships fighter jets and soldiers, just to settle those far away areas with far out business potentials. There will be better appreciation if we use of tax money to buy hardware for disaster preparedness especially with the global cooling trend. Like civilian choppers, small fastcrafts, to rescue by air and water, flood-stranded people. Whatever additional funding for such hardware will have nothing to do with military spending for Spratlys. The military establishment is one huge bureaucracy that can create fictional monsters, just to appease their hunger for more tax money. Finally, let us keep in mind these three facts when entertaining that “more money for Spratlys and the military.” One, our public debt, utang ng gobyerno, now is almost P5 trillion, that’s P5 billion x 1000. Two, about 1/5 of all tax collections yearly are spent on interest payment alone, to pay for past wastes, inefficiencies and corruption in the government. And three, all other sectors in the government are also begging for “more money” – education, healthcare, housing, environment, agriculture, public works, credit, pension, social work, CCT, justice, police, local governments, etc. Let us have more entrepreneurship, more trade, more commerce, more investments, more tourism, more economic globalization. And let us have less unproductive spending in the bureaucracy, including the military. Yesterday and today, the above article attracted several comments from some friends. Here they are, mostly posted in my facebook wall. 5. 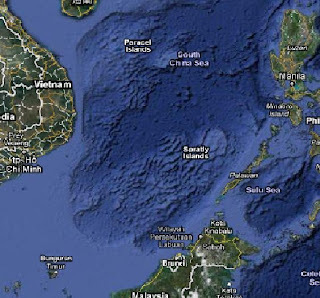 Interesting and valid points you made, but what about the issue of control of the South China Sea sealanes? This is all-important for navigation and shipping. You see, China does not consider itself a claimant. It considers itself the OWNER of these islands, by historic right, occupation, geography, etc. So one important strategy for the Philippines and other ASEAN nations is to engage them, so that they do not try to enforce their claim (or "ownership") over the entire area and thereby affect the balance of power where shipping is concerned. So, what about that angle? We do need to, well, keep taking a look and watch out for Chinese adventurism, which violates the spirit of the 2002 ASEAN-China Declaration of Conduct of Parties in the South China Sea. About more commerce, of course, and that is included in the 2002 document - but then, you have the usual critics in Manila claiming that our dealing with China on joint projects - or tripartite with Viet Nam - is giving up our sovereignty over the Kalayaan Island group (which is what we claim, not the entire Spratlys). What do you say to them? Well, I think you already in effect said it here. -- Mr. V.
Here are my rejoinders to the above comments. On #2, That is one possibility, the Philippines to quit claims over the Spratlys, especially the Kalayaan Group of Islands, in exchange for some deep concessions with China, like more market access to Philippine exports (say zero tariff for several hundreds of export items). But the nationalists and the military bureaucracy will not like it. The latter wants more tax money through more war materials, more battle ships, etc., where potential for huge kickbacks and corruption is huge. On #3, It's true. The extent of corruption in the Philippine military (and many other bureaucracies) is widespread. So if the military get more tax money from us, the corruption will not go away, it may even be exacerbated. On #4, I've heard of it, and I don't believe it. People are happy with the money in their pockets and bank savings, they've worked hard for it. This alone can trigger more commercial activities as people spend their income and savings. But governments get as much of that money as possible through various taxes and fees -- for the military, various bureaucracies, pork barrel, global junkets, etc. This transfer of big amount of money from private hands to government hands causes slower commercial activities, sometimes zero growth. On #5, I like that angle of the Philippines working with the ASEAN to settle differences on the SCS-Spratlys issue. China is among the countries that self-invite themselves in the annual ASEAN summit, that's why this big regional meeting is now regularly called as ASEAN + 3 or ASEAN + 6. Then there is also the China-ASEAN FTA (free trade agreement), the Asia-Pacific Economic Cooperation (APEC), country caucuses and sub-groupings at the WTO and UN, and other bilateral or regional talks. To my mind, it is impossible for China to escape getting engaged in various diplomatic and economic talks with the Philippines and other ASEAN member-countries. One problem is that those communist governments in China and Vietnam may think that their domestic bullying of their own people can be extended in the region. It is good that capitalism in those countries is taming their government authoritarianism. There is one back channel, informal venue that I see, between the two governments: via the Filipino-Chinese businessmen, talking to their mainland Chinese business buddies and partners who have close connections if not influence, with high officials of the China Communist Party (CCP). I think this will help diffuse whatever tension between the two governments. One of my Filipino-Chinese friends told me once that before, Divisoria would have goods mostly made in China but there were also goods made in Taiwan, Vietnam, Indonesia, etc. Now, it's absolute, 100%, all made from China. So one can imagine the strong link between Fil-Chinese and mainland Chinese businessmen. Consider also these recent Philippine trade data. US 11.05%, Japan 10.66%, Singapore 9.55%, China 8.61%, Taiwan 7.73%. In Jan-March 2010, China was also the 4th biggest source of imports, but its % share was only 7.79%. Now if we include smuggling, as many of the goods in Divisoria, Baclaran, etc. are under technical smuggling (ie, understatement of value), China could be the #1 or #2 source of Philippine imports now. Japan 16.31%, US 14.96%, China 11.48%, Singapore 11.15%, HK 8.27%. January to March 2010 exports, China was also 3rd but its % share was only 9.53% of total exports. If there is smuggling in imports, there should also be smuggling in exports. So I think China could be the Philippines' 2nd biggest exports market now. Looking at those numbers in trade alone -- excluded yet are data for investments, tourism, cultural exchanges -- I cannot see why China, getting richer by sending tons and tons of cheap goods, would want to change things by sending tanks and battleships. I support that proposal to have a "rules-based" agreement, so that whatever existing and new agreements that will come out among claimant countries, all signatory countries should abide and follow the agreement. Plain rule of law, applied in foreign affairs. Now there are suggestions that the US should act as an "external umpire" in the South China Sea (SCS) dispute, with Australia or Japan as "secondary umpire." For me, expecting the US as an "umpire" with its own armaments to implement whatever has been agreed upon, is a dream, an illusion. Why? The US was hesitant, even refused, to be dragged for long in Libya, with a much weaker and unpopular enemy named Gadhafi. The US also has problem just pulling out its remaining troops in Iraq, and it is currently engaged in a stalemate look alike in Afghanistan. The various domestic issues like healthcare debate, the unfunded entitlement programs, plugging the huge budget deficit every year, already weigh down the US government. And the US will be expected to get involved large-scale in the SCS? For one, the area is too far. Secondly, the "enemy", China, is too massive militarily. Third, fiscally, China owns the bulk of US public debt, now the most indebted country in the world. If China will just dump its US$ reserves in favor of other currencies like the Euro, China will suffer monetary losses, but it is the US economy that will suffer even more. CHINA GOVERMENT LEAVE SPRATLEYS ISLAND, THIS NOT YOUR TERRITORY, LEARN TO BE CONTENTED OF WHAT HAD GOD GIVEN TO YOU, THIS IS THE TERRITORY OF THE PHILIPPINES, USE YOUR BRAIN IF YOU HAVE. AND PLEASE LET ALL CHINESE GO HOME TO YOUR PLACE AND SO THEIR BUSINESSES. WELL FIGHT FOR THIS COZ THIS IS OURS RIGHT! LEAVE TO OUR LAND THIS IS PHILLIPINE TERRITORY. MAKE YOUR OWN LAND. Hello Anon, I am Anon number 2. I agree with you man. Those Chinese people from China should definitely make their own land and call it CHINA!!! Thanks guys for the comments. I also wish that is possible, that China will just leave Spratlys. I also wish that all forms of foreign semi-occupation, like the US in Iraq and Afghanistan, China in Tibet, will end. But that's not the case. BIG governments, communist or democratic, just want to exceed their sphere of political power. That is why we need LESS government, communist or democratic, more entrepreneurship, more personal and parental responsibility in running their own lives.